2019 Southern Lepidopterists’ Society/Association for Tropical Lepidoptera Combined Annual Meeting, 5-7 April, Georgia Southern University, Statesboro, Georgia (note: this meeting has been re-scheduled from our original meeting dates of 12-14 September 2018 because of hurricane activity at that time). 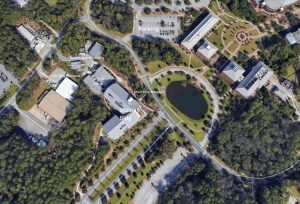 The 2019 SLS/ATL combined annual meeting will be in the Biological Sciences Building at Georgia Southern University in Statesboro, Georgia from Friday through Sunday, 5-7 April, 2018. Campus parking will be free after 4 pm on the Friday (5 April) and throughout the weekend. The Biological Sciences Building (see accompanying Figure 1) is new and has modern facilities. From Interstate 16 westbound, take exit 127 (State Highway 67) north towards Statesboro. After ~13 miles, turn left onto Veteran’s Memorial Parkway. After ~4 miles, turn right onto Old Register Road. Continue to the end of Old Register Road to the T-junction with Forest Drive (there is no road sign for Forest Drive at the time of writing). Turn right onto Forest Drive. After ~ 50 m, turn left into the Faculty/Staff parking lot and park. Walk to Biological Sciences Building main entrance (see Figure 2) to register for the meeting. From Interstate 16 eastbound, take exit 116 (State Highway 301) north towards Statesboro. After ~13 miles, turn right onto Veteran’s Memorial Parkway. Immediately get in the left lane and take the first left onto Old Register Road. Continue to the end of Old Register Road to the T-junction with Forest Drive (there is no road sign for Forest Drive at the time of writing). Turn right onto Forest Drive. After ~ 50 m, turn left into the Faculty/Staff parking lot and park. Walk to Biological Sciences Building main entrance (see Figure 2) to register for the meeting. Springhill Suites by Marriott, 105 Springhill Drive, Statesboro, GA 30458; Phone: (912)489-0000. Super 8 by Wyndom, 1 Jameson Ave, Statesboro, GA, 30458; Phone: (912)225-0403. Eagle’s Nest, 225 Lanier Drive, Statesboro, GA 30458; Phone: (912)871-2525. Comfort Inn & Suites, 17870 Georgia Highway 67, Statesboro, GA 30458; Phone: (912)681-2400. Hampton Inn, 350 Brampton Ave., Statesboro, GA 30458: Phone: (912)489-8989. Studio 6, 126 Rushing Lane, Statesboro, GA 30458; Phone: (912)681-4663. 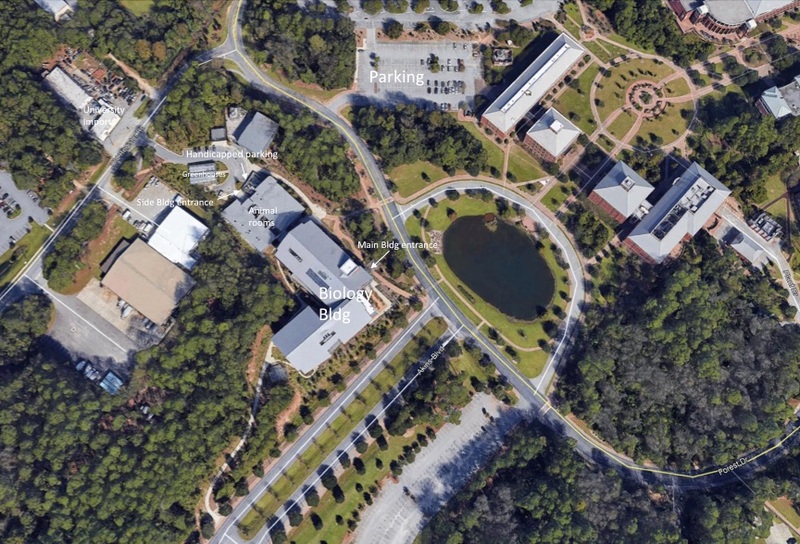 The closest lot to the Biological Sciences Building is the lot off Forest Drive (see maps) – signposted “Faculty and Staff Permit Parking.” Handicapped Parking is available in all parking lots. The closest handicapped parking (2 spaces) is next to the Biology greenhouses and shown (with arrows) in the accompanying Google Earth map. To access these 2 handicapped parking spaces, turn right off Old Register Road (immediately opposite “University Imports”) onto a small, unnamed paved side road. There are also a few regular parking spots in this area but they are usually already taken. BIOLOGICAL SCIENCES BUILDING (4324 Old Register Road, Statesboro, GA 30458) (Note: Google Earth shows a warehouse at this address next to the Biology Building). The Biological Sciences Building is easy to spot from both recommended parking lots (see accompanying Google earth map). The building stands alone and has glass panels in several sections. DO NOT go to the Natural Sciences building which on the other side of campus. Enter the main entrance of the Biological Sciences Building into the Foyer/Registration area (with a large screen information system, staircase, etc.). Our meetings will be held in adjacent lecture room 1109. We will have a group dinner (Dutch treat) with door prizes at the Millhouse Restaurant (1301 Statesboro Place Circle, Statesboro, GA 30458) starting at 6 pm on the Saturday evening (6 April). ; phone: 912-478-5591). There will be opportunities to set up light sheets (possibly light traps as well) in a natural habitat near campus on Friday night (5 April). Again, please contact Lance Durden if you would like to set up light sheets or traps. Also, James Adams will be trapping at Ohoopee Dunes Natural Area (type locality for Fernaldella georgiana), which is ~35 miles from Statesboro, on the night of 4 April (Thursday) just before the meeting; if anybody wants to join him there, please contact him on his cellphone (678-767-5938). IF there is sufficient interest, trapping at Ohoopee Dunes may also be available on the night of 5 April (Friday); this will be discussed, along with other options, at the meeting. There should be native nectar sources around the Biology building so there should be local butterfly activity during our meeting. Anybody wishing to set up light sheets or light traps should bring their own equipment and will be asked to sign a waiver. Figure 1. Biological Sciences Building at Georgia Southern University; site of the 2018 SLS/ATL annual meeting. Figure 2. 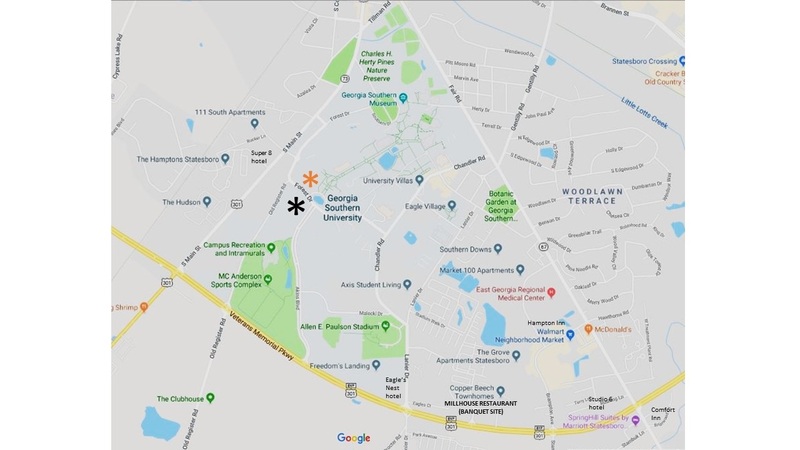 Google map of the Georgia Southern University campus showing the location of the Biological Sciences Building (large black asterisk), and recommended parking site (large orange asterisk). The Banquet restaurant and locations of recommended hotels are also shown. State highways 67 and 301, the main access routes from Interstate 16 to the south, are also shown. Figure 3. 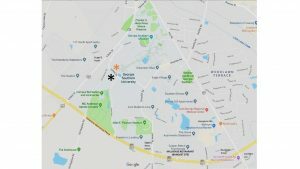 Google Earth map showing the location of the Biology building (site of the SLS/ATL meeting), building entrances (please use the main entrance, if possible), and parking areas, including the closest handicapped parking spaces. The annual meeting of the Southern Lepidopterists’ Society and the Association for Tropical Lepidoptera will be held this year with that of the Lepidopterists’ Society at Georgia Southern University in Statesboro, GA on September 14-16.